Katie Grinnan's "Mirage" from her recent show at Brennan & Griffin is a painstaking testament to the movements of the human body. 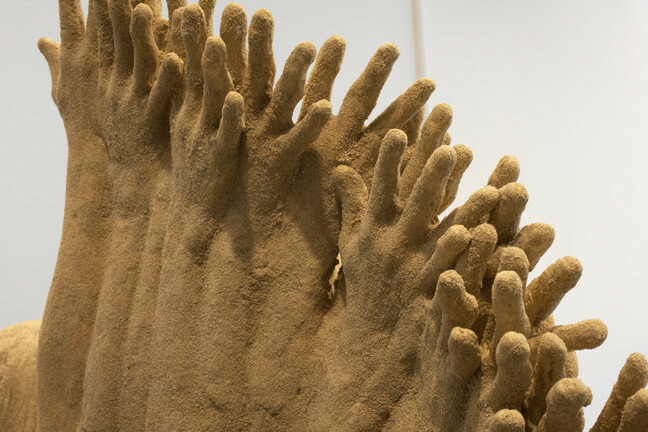 While Grinnan's other sculpture, "Brainwaves" focused on the mind and its potential boundaries, "Mirage" is a physical representation of peripersonal space. It is an exercise in exploring the potential of one's body while literally addressing the surrounding environment. Grinnan created the striking sculpture by casting molds of her own body at incremental points in her daily yoga routine. "Mirage" appears to be an explicit recreation of the passage of time through the body, a la the French chronophotographer Étienne-Jules Marey, but Grinnan also cites sculptures of Hindu gods as a major reference for the work. With their multiple limbs, the depiction of the gods reflects a timelessness that "Mirage" so gracefully captures. "Mirage" encompasses a range of motions, but at its core it is about "everyday superposition" as the sequential poses occupy the same moment in time. Constructed with sand, "Mirage" looks as if it could disintegrate at any moment, lost to the inevitability of time passing.